Review: Yogurt Bay, Every Belly is invited! Yoghurt has been a part of the Indian diet for years, but people have just about started warming up to the idea of frozen yogurt as dessert. From International & domestic chains planning aggressive expansion in India, attractive pricing & localization of taste, various Yogurt brands are wooing consumers. On a rainy Mumbai Evening, we decided to explore Yogurt Bay at Carter Road, Bandra, a delightful little yogurt parlor located just behind the Café Coffee Day outlet. It was around 11 in the night but there was a huge crowd outside the outlet. A smiling server was waiting outside to let 2-3 people inside. Our turn came soon & as soon as we entered, our eyes fell upon a large counter full of yummy, colorful toppings manned by uniformed servers. Behind the servers were three machines, which churned out colorful flavored yogurt swirls. The menu, displayed on the wall boasted of parfaits, range of smoothies, frozen yogurt flavors and yogurt sundaes. A serving of flavored yogurt can be chosen in mini, small, regular or a shared cup size. First, we tried the Blueberry cheesecake, the flavor of the day & were taken by its taste. With creamy blueberry yogurt topped with blueberry compote and insanely delicious crumbled cheesecake base, the dessert was like tasting New York cheesecake in a cup. Next, we tried the peach and mango yogurt in a small size. The flavor created with blending delicate combination of fresh peaches and ripe mango was subtle and fun. I had been eyeing the colorful poppers since a long time & finally got a chance to sample them with the French vanilla flavor. Creamy, sweet vanilla yogurt was complimented well with the delightful poppers, which squirt juice on being popped. Satiated but still craving for more, we went for the Java Chip yogurt. This dark, coffee flavored yogurt was topped with the right amount of cream & cake crumble, making it wholesome with layers of varied tastes. We stepped outside to a dark night, with a promise to return soon. 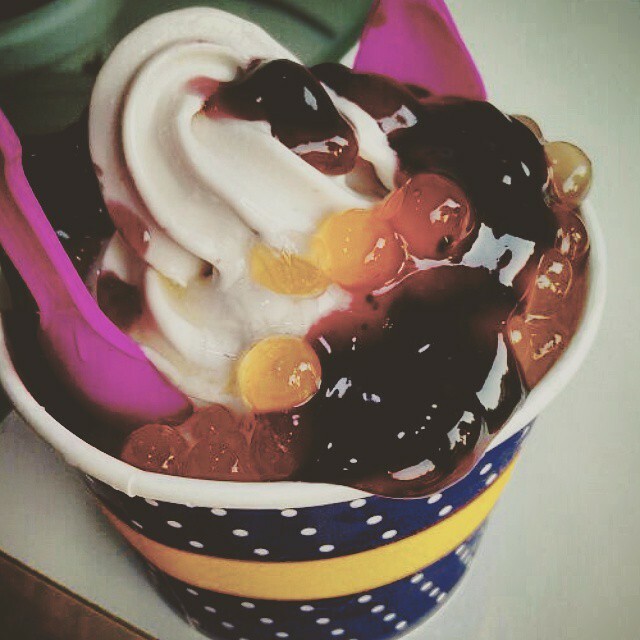 The frozen yogurt industry boasts a guilt-free indulgence by claiming to be a healthier option. 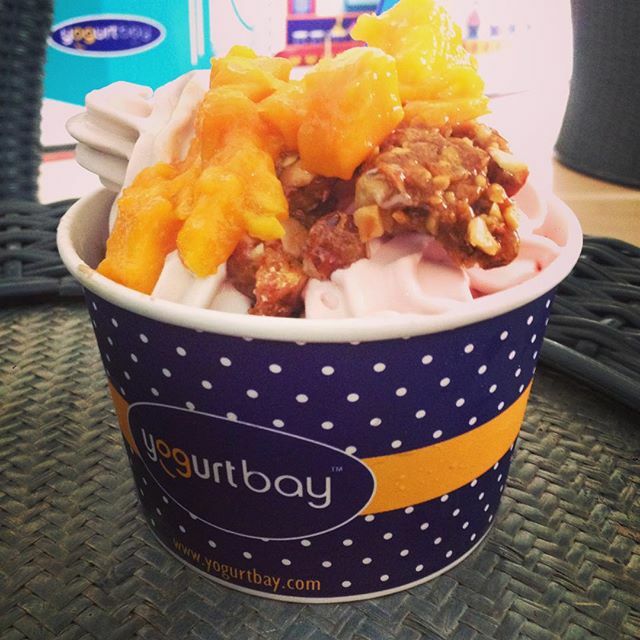 All the flavors, we tried at Yogurt Bay were flavorful, creamy and delectable. Patrons can even try signature desserts like 'Strawbella', which is strawberry yogurt topped with strawberry pieces, marshmallows, kit-kat and vanilla muffin crumble or get in touch with your creative side and come up with something absolutely unique! Do not miss a serving if you are at Carter’s, it will lift your spirits without the added calories. If in a rush, the smoothies are a good alternative.